We have established ourselves among the most reputed Manufacturers of Brass Metal Strips in the country. We have developed Metal Strips using high quality raw materials. They are accessible in various grades, shapes and sizes as per the requirements of the clients. Durability, consistency, precision, and high performance are some of the salient features that distinguish our Industrial Brass Strips in the Indian market. Moreover, we supply High Precision Brass Strips for the production of automobile radiators. In addition to the above facts, our Brass Strips are served at Industryâ��s best price. 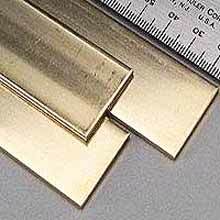 Brass Strips are manufactured by us from sheets that are slit into the desired specifications needed by clients. With our forward integration, we are able to drive better productivity for clients to save costs on scrap value, investment on product and transportation. Besides, we use state of the art slitting lines to achieve good accuracy in the Brass Strips provided by us.